The 1880 Republican National Convention convened from June 2 to June 8, 1880, at the Interstate Exposition Building in Chicago, Illinois, United States, and nominated Representative James A. Garfield of Ohio and Chester A. Arthur of New York as the official candidates of the Republican Party for President and Vice President, respectively, in the 1880 presidential election. Of the 14 men in contention for the Republican nomination, the three strongest candidates leading up to the convention were Ulysses S. Grant, James G. Blaine, and John Sherman. Grant had served two terms as President from 1869 to 1877, and was seeking an unprecedented third term in office. He was backed by the Stalwart faction of the Republican Party, which supported political machines and patronage. Blaine was a senator and former representative from Maine who was backed by the Half-Breed faction of the Republican Party. Sherman, the brother of Civil War General William Tecumseh Sherman, was serving as Secretary of the Treasury under President Rutherford B. Hayes. A former senator from Ohio, he was backed by delegates who did not support the Stalwarts or Half-Breeds. On the first ballot, Sherman received 93 votes, while Grant and Blaine had 304 and 285, respectively. With 379 votes required to win the nomination, none of the candidates was close to victory, and the balloting continued. After the thirty-fifth ballot, Blaine and Sherman switched their support to a new "dark horse" candidate, James Garfield. On the next ballot, Garfield won the nomination by receiving 399 votes, 93 higher than Grant's total. Garfield's Ohio delegation chose Chester A. Arthur, a Stalwart, as Garfield's vice-presidential running mate. Arthur won the nomination by capturing 468 votes, and the longest-ever Republican National Convention was subsequently adjourned. The Garfield–Arthur Republican ticket later defeated Democrats Winfield Scott Hancock and William Hayden English in the close 1880 presidential election. As President of the United States, Rutherford B. Hayes had caused heated tensions within the Republican Party. Hayes had moved away from party patronage by offering government jobs to Southern Democrats instead of Northern Republicans. His actions drew heavy criticism from those inside his party, such as Roscoe Conkling of New York and James G. Blaine of Maine. Hayes had known since the dispute over the 1876 election that he was unlikely to win in 1880, and had announced at his 1877 inauguration that he would not run for a second term. Without an incumbent president in the race, the rival factions within the Republican Party, the Stalwarts and the Half-Breeds, eagerly anticipated the 1880 presidential election. At the close of Grant's two terms as president in 1877, the Republican-controlled Congress suggested that Grant not return to the White House for a third term. Grant did not seem to mind and even told his wife Julia, "I do not want to be here [in the White House] another four years. I do not think I could stand it." After Grant left the White House, he and his wife decided to use their US$85,000 of savings to travel around the world. A biographer from the New York Herald, John Russell Young, traveled with the Grants and documented their journey to exotic places around the world in a book later published called Around the World with General Grant. Young saw that Grant's popularity was soaring, as he was treated with splendid receptions at his arrival in Tokyo and Peking, China. After Hayes' falling-out with the Republican Party and a perceived desire on the part of the United States' electorate for a strong man in the White House, Grant returned to the United States ahead of schedule, in hopes of seeking a third term in office. With the backing of the Stalwarts and calls for a "man of iron" to replace the "man of straw" in the White House, Grant was confident that he would receive the Republican nomination for the presidency. Roscoe Conkling, the leader of the Stalwart faction, formed a "triumvirate" with J. Donald Cameron of Pennsylvania and John A. Logan of Illinois to lead the campaign for Grant's return to the White House. With a Grant victory, Conkling and other Stalwarts would have great influence in the White House. Grant knew he could count on the Stalwart leaders to solidify their respective states in order to guarantee a Grant victory. Conkling was so confident in Grant's nomination that he said, "Nothing but an act of God could prevent Grant's nomination." An aide to the ex-president, Adam Badeau, commented that Grant had become "extremely anxious to receive the nomination" and did not think that there was any chance of failure. However, close friends of Grant saw that his public support was slipping. John Russell Young took Grant aside and told him that he would lose the election, and should withdraw to avoid embarrassment. Young argued that Grant was being heavily attacked by opponents, who were against the concept of a presidential third term. Young also criticized the handling of the campaign and told Grant that if he won the election, he would be indebted to the "triumvirate". Grant felt that his Stalwart friends had been of great assistance in his election bid, and they deserved political patronage in his administration. Grant, nonetheless, listened to Young's advice and wrote a letter to J. Donald Cameron, authorizing his name to be withdrawn from the nomination contest after consultation with his other Stalwart backers. Upon hearing of his letter, Julia Grant was insistent that her husband should not withdraw his name from the contest. She said, "If General Grant were not nominated, then let it be so, but he must not withdraw his name – no, never." Young delivered the letter to the "triumvirate" in Chicago on May 31, but no action was taken to remove Grant's name. The other main contender for the Republican nomination was James G. Blaine. Blaine, a senator from Maine who had also served in the United States House of Representatives, including holding the Speaker of the House position from 1869 to 1875, was in the competition to prevent Grant's nomination. Four years earlier Blaine had campaigned for the party's nomination; in the weeks prior to the 1876 convention, he was accused of committing fraudulent activities involving railroad stocks. The specifics of Blaine's involvement were detailed in the Mulligan letters. Blaine pleaded his own defense on the floor of the House of Representatives, and he read aloud selected, edited portions of the letter that were not incriminating. Despite his attempt to clear his name, Blaine was tarnished by the scandal throughout the rest of his political career. On the Sunday before balloting was to begin in Cincinnati, Ohio, Blaine collapsed at the steps of Washington Congregational Church. He was unconscious for two days, and as a result, he lost supporters who were doubtful over his health and whether he was capable of handling the presidency. Blaine was also ridiculed by opponents, who accused him of faking illness to gain sympathy; the New York Sun headlined "Blaine Feigns a Faint". On the first ballot of the 1876 convention, Blaine received 285 votes, while his political enemy, Roscoe Conkling, was in second place with only 99 votes. Blaine and Conkling had a long-standing political feud that started at a debate on the floor of the House of Representatives in 1866. After six more ballots resulted in no consensus, Conkling switched his support to Rutherford B. Hayes, who ultimately beat Blaine for the nomination. He must be nominated at Chicago in June, or else forever give up any idea of gaining the Chief Magistry of the nation... I think he owes it to himself and to his friends all over the country who are ready to sacrifice everything for his success to do all that is in his power to win at Chicago. Despite the Mulligan letters scandal, Blaine had succeeded remarkably in his 1880 campaign, attracting nationwide support for his candidacy. He argued for the gold standard, support for big business, a tariff to protect American jobholders, civil rights for freed blacks and Irish independence. John Sherman was a longtime senator from Ohio who also served the state in the House of Representatives in the late 1850s and early 1860s. As a senator, Sherman led the planning of the national banking system. He also oversaw the national policy for the post-Civil War banking system, and helped restore the nation's finances after the Panic of 1873. Under President Hayes, Sherman served as the Secretary of the Treasury, advocating for the gold standard and building up the country's gold reserves. Sherman's colleagues did not have much confidence in their presidential bid. Sherman was known as the "Ohio Icicle" for his uncharismatic personality, which made him unappealing to voters. His colleagues commented that in public, Sherman "was not eloquent, though a graceful speaker, confining himself almost entirely to statements of fact." In private, he was "reserved, self-contained," a personality that many Americans were not comfortable with. As President, Sherman intended to continue his support for the gold standard. Prior to the start of the convention, papers had predicted Sherman to receive 110 votes in the balloting. Sherman felt that he still had a chance at the nomination once the Grant vote broke apart after five or six ballots. James Garfield came into Chicago as a Senator-elect from Ohio, who had represented the state in the United States House since 1863. In 1859, as a Republican, Garfield was elected to the Ohio Senate. The following year, he was admitted to the Ohio bar. He served as state senator until 1861, when he enlisted in the Union Army at the start of the Civil War. Garfield was assigned to command the 42nd Ohio Volunteer Infantry, and had the task of driving Confederate forces out of eastern Kentucky. Garfield later led an attack with a number of infantry regiments against a Confederate cavalry at Jenny's Creek on January 6, 1862. The Confederates retreated, and for leading his men to victory, Garfield was promoted to the rank of brigadier general in March 1862. Garfield later served under Major General Don Carlos Buell at the Battle of Shiloh and under Thomas J. Wood at the Siege of Corinth. Garfield's health deteriorated and he was sent to serve on a commission to investigate the conduct of Union general Fitz John Porter. In the spring of 1863, Garfield returned to the field as chief of staff for William S. Rosecrans, commander of the Army of the Cumberland. After the disastrous Chickamauga campaign in September 1863, Rosecrans was relieved of his command. Garfield saved his own reputation by fighting bravely during the battles, and he was subsequently promoted to the rank of major general. Garfield's fame spread, and William Dennison engineered Garfield's 1863 election to Congress. As Whitelaw Reid commented, Garfield was "the most able and prominent of the young politicians who entered the army at the outbreak of the war." Garfield did not want to leave the army, so he personally visited President Abraham Lincoln for advice on the matter. Lincoln told Garfield that he had more generals than he could handle, and what he needed was political support. Garfield succeeded in gaining re-election for his House seat every two years. In 1872, Garfield faced charges for receiving $329 in tainted money from the Crédit Mobilier of America corruption scandal. Garfield repeatedly denied the charges and even hired William E. Chandler to defend him in front of the congressional investigators. There was not much evidence against Garfield, so his political career was not significantly affected. Four years later, when James G. Blaine moved from the House to the United States Senate, Garfield became the Republican floor leader of the House. That year, Garfield served as a member of the Electoral Commission that awarded 20 hotly contested electoral votes to Rutherford B. Hayes in his contest for the Presidency against Samuel J. Tilden. Prior to the 1880 Republican National Convention, Garfield had expressed that he was a Blaine supporter. It was not until John Sherman entered the race that Garfield switched sides, and offered his support for the "Ohio Icicle". In January, caucuses were held in local districts to pick delegates. The state conventions would then select a number of these delegates to represent the state at the national convention. Prior to the convention, there was a great deal of machine politics conducted by the candidates. John Sherman utilized Treasury Department employees who owed their jobs to him to meet up at local caucuses across the South to guarantee loyal state delegations. State-level bosses, like Roscoe Conkling, used the state conventions to pick delegates that were politically allied to a particular candidate. In the state delegate-selection convention at Utica, New York, Grant's supporters carried only a 217–180 majority over Blaine supporters, but Conkling passed a resolution declaring that, "the Republicans of New York believe the re-election of Ulysses S. Grant as Presidential candidate of urgent importance, and the delegates this day assembled are called upon and instructed to use their earnest and united efforts to secure his nomination. Conkling commanded delegates to follow the resolution, and if they were to violate it, he guaranteed they would be victims of political revenge and personal dishonor. However, in Chicago, there were a number of New York delegates who went against the resolution and publicly expressed their support for Blaine. J. Donald Cameron used similar tactics to intimidate dissenters in the Pennsylvania state convention. The third member of the "triumvirate", John A. Logan, literally locked out Blaine supporters from the Illinois state convention, and replaced them with personally chosen Grant supporters. By May 29, four days before the opening of the convention, trainloads upon trainloads of delegates, lobbyists, reporters, and campaign followers had arrived at the Union and Dearborn railway stations in Chicago. Candidate supporters channeled through the Chicago streets with daily parades and rallies. Pre-convention possible outcomes of the voting were published by a number of sources. One, from the Albany Evening Journal, predicted Blaine with 277 votes, Grant with 317, Sherman with 106, and 49 for the other candidates. All of these predicted candidate vote totals were short of the 379 needed to win. Many in Chicago knew that a victor, most probably Grant, would only be determined if the unit rule, which postulated that all delegates from a particular state must vote for the candidate preferred by that state's delegation, was to be in effect. If that was not the case, then a long deadlock would result until one side succumbed to the other. Before any voting began, the delegates had to vote on the important matter of the unit rule. Prior to the start of the convention, James Garfield noted, "I regard it [the unit rule] as being more important than even the choice of a candidate." If the rule was supported by a majority of the delegates, then state party bosses, like the members of the "triumvirate", would be able to solidify Grant's nomination bid. If Conkling and the other Stalwart bosses had their way, the nearly sixty dissenters from the states represented by the "triumvirate" would be silenced. Unfortunately for Half-Breeds, J. Donald Cameron was chairman of the Republican National Committee. Cameron planned to exercise his power to adopt new rules for the convention, and also suppress any dissenters of the unit rule. His plan was leaked, and within days, almost all the delegates in Chicago knew about it. Supporters of the Sherman and Blaine campaigns knew that they had to prevent Cameron from exercising his power. Blaine's forces agreed that they could only prevent Cameron from imposing the unit rule by removing him as the chair of the Republican National Committee. An 1880 political cartoon depicts Senator Conkling over a "presidential puzzle" consisting of some of the potential Republican and Democratic nominees as pieces of a sliding puzzle. At 7:00 P.M. on May 31, J. Donald Cameron convened the Republican National Committee's last meeting before the opening of the convention. Of the forty-six men at the meeting, Cameron counted only sixteen allies. The rest of the men were anti-Grant delegates who had decided to gang up on Cameron. Colorado senator Jerome B. Chaffee was the first to bring up the unit rule at the meeting. Chaffee handed Cameron a handwritten motion that was orchestrated by William E. Chandler. Cameron expected this, and knew he had to find some fault in Chaffee's motion. Cameron called Chaffee's motion out of order. Upon being questioned by Chaffee, Cameron explained that the committee could only appoint a temporary chairman to the convention, and could not vote on the unit rule issue (which he said belonged to the Rules Committee). Cameron then used George Cornelius Gorham, a California Stalwart delegate who as secretary of the United States Senate had become an expert on parliamentary procedure, to justify his ruling. One by one, anti-Grant delegates unsuccessfully tried to appeal Cameron's motion. Gorham proclaimed that as committee chairman, Cameron could do "as he saw fit." Marshall Jewell, a Connecticut delegate and national committee member who had served in Grant's administration as Postmaster General, spoke up against Cameron's rulings. Cameron did not comment, and then called for a brief recess. After the recess, he acknowledged a motion from William E. Chandler to elect George Frisbie Hoar, a neutral senator and delegate from Massachusetts, as the convention's temporary chairman. The committee voted 29–17 in favor of electing Hoar as temporary chairman of the convention. At midnight, the committee was adjourned, and the members agreed to continue the meeting the following morning. News of Cameron's behavior had spread throughout town overnight. His hardliner strategy had failed, and Conkling and other Grant managers sought to control the situation before it became any worse. The next morning, Conkling asked his trusted colleague, Chester A. Arthur, to solve the problem. Arthur assessed the situation and drew up a compromise. He met Chandler and the rest of the anti-Grant cabal at the entrance of the committee's suite. Arthur acknowledged that the Grant men had rejected Senator Hoar as the temporary convention chairman the day before, but said that the Grant men might perhaps reconsider. He proposed that the delegates decide on the unit rule in a free vote, and in return, Don Cameron would be restored as the chairman of the national committee. After discussing for a number of minutes, the two men came to an agreement. Arthur was confident that since Chandler, the leader of Blaine's campaign, had accepted the deal, then "it would be agreed by the Grant men." Chandler then discussed the compromise deal with the thirty anti-Grant committee members, and also James Garfield, who had previously expressed his opposition to the unit rule. 23 out of 30 anti-Grant men agreed to the terms, and Garfield commented that the proposition "must be accepted" in "spirit of reconciliation." The committee reconvened again on the afternoon of June 1, with J. Donald Cameron sitting as the committee chairman. Arthur made a number of motions, indicating that the Grant men from New York and Pennsylvania would support Senator Hoar's appointment as the temporary chairman of the convention. No one objected and the motions were accepted. The meeting was then adjourned. A reporter from the New York Tribune later remarked that the Grant followers had been "saved from utter ruin by the excellent management of General Arthur...."
A view inside the Interstate Exposition Building (known as the "Glass Palace") during the convention; James Abram Garfield (center, right) is on the podium, waiting to speak. At noon on Wednesday, June 2, J. Donald Cameron banged his gavel to commence the beginning of the seventh Republican National Convention. As instructed, Cameron placed the nomination for Senator Hoar as the temporary convention chairman. The nomination was passed unanimously. Later, delegates John H. Roberts of Illinois and Christopher L. Magee of Pennsylvania were made temporary convention secretaries. Senator Eugene Hale of Maine submitted a resolution for a roll call, in which the chairman of each delegation would announce the people from their delegation serving on the convention's three committees. The committees were formed, and the convention was adjourned at five minutes past three in the afternoon. The convention reconvened at 11:00 A.M. on June 3. Roscoe Conkling submitted a motion for a recess, but the motion was rejected. Another New York delegate, Henry R. Pierson from the Committee on Permanent Organization, submitted a proposal to make the temporary convention assignments permanent. The motion was adopted, and the convention took a four-hour recess until 5:00 P.M. After the recess, a motion was made for the Committee on Rules to be directed to report, but a substitute motion from George H. Sharpe of New York called for the Committee on Credentials to report. The substitute motion was rejected by a vote of 406 to 318, and the original resolution was laid on the table. At 7:30 P.M., the convention was adjourned until 10:00 A.M. the following morning. The next morning, Conkling then submitted a resolution that bound every delegate in the hall to support the party's nominee. Conkling said that "no man should hold his seat here who is not ready so to agree." A voice vote was called, and the resolution received nearly unanimous delegate support. However, about a dozen or so delegates answered "no". Conkling was shocked. He asked, "[who] at a Republican convention would vote 'no' on such a resolution?" He then demanded a roll call to identify the dissenters. Most of the dissenters chose not to declare their disagreement in front of the thousands of spectators at the "Glass Palace". Only three delegates, all from West Virginia, voted "no" to the resolution, and were showered with a "storm of hisses." Conkling then issued another resolution to strip the three West Virginians of their votes and squash their voices at the convention. The West Virginians revolted against Conkling's resolution, and heavily criticized him for his motion. James Garfield, who was sitting at the Ohio delegation, stood up and tried to settle the matter. He stated that the convention would be making a big mistake if they approved Conkling's motion, and he asked the delegates for their time in order to state his case. Garfield argued that the three West Virginians should not "be disenfranchised because they thought it was not the time to make such an expression [about a candidate]." He stated that "there never can be a convention...that shall bind my vote against my will on any question whatever." Garfield had won the crowd over with his speech. Conkling did not particularly enjoy the situation. He scribbled a note to Garfield which read, "New York requests that Ohio's real candidate and dark horse come forward...R.C." Afterwards, the fight over credentials erupted into a free-for-all. After John A. Logan had barred anti-Grant delegates from the state convention earlier in the year, they had decided to file credential reports. At the meeting between Arthur and Chandler, both men had agreed that the credentials issue could be discussed at the convention. A Chicago lawyer who supported Grant, Emery Storrs interrupted the legal argument over credentials by mocking the Blaine campaigners. His remarks set off a barrage of comments from both the Blaine and Grant sides. The convention went out of control, as people started shouting and jumping throughout the convention hall. As Garfield commented, the convention "seemed [as if] it could not be in America, but in the Sections of Paris in the ecstasy of the Revolution." The fracas continued until 2:00 A.M. when acting chairman Green B. Raum, the United States Commissioner of Internal Revenue, banged the gavel to end the demonstration. On Saturday night, the alphabetical roll call of the states to present nominees was conducted. The first candidate for the Republican nomination emerged when the Michigan delegation was in roll call. James F. Joy, the seventy-year-old president of the Michigan Central Railroad, gave the speech nominating Blaine. Joy was not a practiced public speaker, and he stumbled and rushed through his nomination speech, "because we are all now impatient for the voting." Joy ended his speech by nominating "James S. Blaine" for the Republican ticket. Promptly, a number of delegates yelled back, "G! G. Blaine, you fool!" The delegates from the next state in the roll call, Minnesota, nominated Senator William Windom as their "favorite son" candidate. 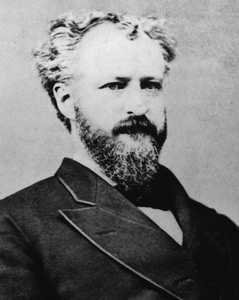 Nine states later, Roscoe Conkling of New York stepped up to the podium to present his nomination for Ulysses S. Grant. The crowd of 15,000 responded by erupting in cheers. Conkling built up the crowd's energy with his speech, and then introduced his candidate by proclaiming, "New York is for Ulysses S. Grant. Never defeated–never defeated in peace or in war, his name is the most illustrious borne by living men." He later spoke of Grant's loyalty to the American people, and then scolded Grant's enemies who had brought up the third term issue. Conkling tried to show that Grant was an honest person who had won the delegates "without patronage and without emissaries, without committees, [and ] without bureaus...." After Conkling finished his speech, boos and hisses came from Blaine and Sherman backers, while applause was heard from Stalwart supporters of Grant. After North Carolina's roll call, the Ohio delegation brought out James Garfield to give the nomination speech for John Sherman. Garfield had not actually written a speech, and was nervous about speaking in front of such a large crowd. Before heading to Chicago, Sherman told Garfield that Garfield's speech should stress Sherman's "courageous persistence in any course he had adopted." Garfield started his speech by emphasizing his overwhelming pride for his role in the convention. Garfield then listed the qualities that a president should possess and stressed the importance of party unity. It wasn't until near his conclusion that he mentioned Sherman by name. Many reports of Garfield's speech describe it as enthusiastic, eloquent, and well received. Some accounts indicate that it was so well-received that it caused delegates to begin thinking of Garfield as a contender for the presidential nomination. On the other hand, some members of the Sherman campaign were disappointed by Garfield's speech. One telegram from a Sherman backer sent to Sherman himself claimed that, "[Garfield] has been of no service to you...he was extremely lukewarm in his support." Rumors began to spread that Ohio Governor Charles Foster and Garfield, who were in adjoining suites at the Grand Pacific Hotel, were "conspiring to bring Garfield out as [a] candidate...." News of the finger-pointing within the Sherman camp had carried into newspapers across the country. The Albany Evening Journal reported that "[t]here is a general belief that the Ohio delegation is ready to desert Sherman and go over to Blaine in a body." Although he had become popular with the delegates after his speech, Garfield was upset over the accusations of those inside the Sherman group, and he worried how they would affect him in the future. His close colleagues felt he was becoming too popular, too quickly. Friends, like Lorenzo Coffin, felt that his "time is not yet." Garfield heeded the advice of his friends to lower his profile at the convention, but he had already made a deep impression on the delegates. Late Sunday night on June 6, Indiana senator Benjamin Harrison, grandson of former President William Henry Harrison, came to Garfield's hotel suite and asked him under what conditions he would accept the nomination. Garfield replied that he had come to the convention for the sole purpose of supporting John Sherman, and told Harrison that Garfield's "name must not be used [in the nomination]." At ten o'clock on Monday morning, convention chairman Hoar banged his gavel to open the convention. Eugene Hale moved to immediately proceed to the presidential nominee balloting, and Roscoe Conkling seconded the motion. Newspapers had predicted the results of the balloting, and the delegates knew that it would take a number of ballots before a victor could be found. The first surprise during the balloting roll call came when John A. Logan of Illinois announced that of his state's forty-two delegates, only twenty-four were in support of Grant. This was not as "solid" as Logan had previously advertised to the rest of the Grant backers. New York faced a similar situation. Of its seventy delegates, fifty-one supported Grant, seventeen were for Blaine, and the remaining two supported Sherman. Pennsylvania fared even worse, as only thirty-two of the state's fifty-eight delegates put in their support for Grant. After all the states were polled, the results were tabulated. Grant received 304 votes, Blaine had 284, Sherman had 93, Vermont senator George F. Edmunds received 34, Elihu B. Washburne, who had served as the United States Ambassador to France under President Grant, had 30, and Minnesota senator William Windom received 10. Of the states represented by the "triumvirate", sixty delegates did not support Grant. None of the candidates were close to the 379 needed to secure the nomination, so the balloting continued throughout the day. In Washington, D.C., both Blaine and Sherman were disappointed by their first-ballot vote totals. Blaine had been told that he should expect around 300 first-ballot votes, but his actual total fell sixteen short, and it was also one vote fewer than the total he received on the first ballot at the 1876 Convention. Sherman was told to expect 110 votes, which was significantly lower than the expected totals for Blaine and Grant. However, Sherman felt his chance would come later, when the Grant vote split apart. After Sherman heard his first-ballot vote totals, he grew visibly angry that "some of them [the votes] were taken away from him before the ballot began." He was upset that nine Ohio delegates bolted from Sherman and voted instead for his opponent, James G. Blaine. Sherman blamed Blaine for causing the delegates to bolt from Ohio "by [methods of] falsehood, ridicule and treachery." In Galena, Illinois, Grant did not express any emotions after being told about the first-ballot vote totals. As one newsman reported, "[t]he silent soldier was smoking his cigar with all his usual serenity." Grant's wife, Julia, expected a deadlock, and suggested to her husband that he surprise the delegates in Chicago with a visit. Grant thought this was unwise because it gave an appearance of bad luck and bad manners. Despite his wife's attempts to change his mind, Grant remained adamant. Meanwhile, the delegates at the convention continued to cast ballots until a victor could be determined. On the second ballot of the day, a Pennsylvania delegate named W. A. Grier cast a vote for James Garfield. However, the Garfield support remained with that one delegate's vote for most of the day. The delegates cast eighteen ballots before taking a recess for dinner. After dinner, they came back and cast ten more ballots. Still, no candidate was close to the 379 votes needed to win. After twelve hours of balloting, Massachusetts delegate William Lovering moved to adjourn for the night. A few Grant delegates objected, but the motion to adjourn was passed by a vote of 446 to 308. After twenty-eight ballots, Grant had 307 votes, Blaine had 279 and Sherman had 91, and the rest of the votes were split between favorite son candidates like William Windom and George F. Edmunds. Suggestions for introducing a "dark horse" candidate began to take place. Members backing each candidate were equally determined to win the nomination, but some felt that the deadlock could not be broken if new candidates were not introduced into the balloting. Backers for Sherman and Blaine met after the convention was adjourned. Chandler laid down his terms. Blaine had nearly 300 votes, and could not simply withdraw. As Chandler explained, even "[i]f Mr. Blaine permits his column to be broken, [then] Iowa, Nebraska, Kansas, Nevada, California, Oregon & twelve votes in the Territories will go to Grant...[as would] Mr. Blaine's Southern votes." Both sides argued until two or three in the morning, but no decision had been reached. Grant leaders had also met that night in Roscoe Conkling's suite in the Grand Pacific Hotel. They discussed the imposing dangers of Grant's nomination bid, such as the third-term resistors. Many speculated that Grant was not going to receive the nomination. The Grant backers discussed the other two chief candidates, and found them both to be unacceptable. Some of the men called for Conkling himself as a substitute for Grant. They argued that with Grant out of the race, Conkling would face little resistance for the Republican nomination. However, Conkling refused to accept the idea of being nominated for president. He said "[even] if I were to receive every other vote in the Convention, my own would still be lacking, and that I would not give. I am here as the agent of New York to support General Grant to the end. Any man who would forsake him under such conditions does not deserve to be elected, and could not be elected. The first ballot on Tuesday morning, June 8, saw two major breaks in the voting. Massachusetts switched their twenty-one votes from Senator George Edmunds to John Sherman, spiking his total to 116, the highest thus far. William Chandler also convinced three Minnesota delegates to switch their support from their "favorite son" candidate, William Windom, to James G. Blaine. By the thirty-second ballot, Blaine had dropped six votes from the night before, and Grant had increased his total to 309. Despite the relatively small changes in votes totals Roscoe Conkling confidently claimed that the "[m]embers of the N.Y. Delegation assert that Grant will be nominated before one o'clock." On the thirty-third ballot, nine Wisconsin delegates shifted their support from Grant to Elihu Washburne. On the next ballot, sixteen of twenty Wisconsin delegates changed their vote to James Garfield. Garfield immediately called to chairman Hoar to raise a question of order. Garfield "challenge[d] the correctness of the announcement", claiming that without his consent, he should not be receiving votes. Hoar dismissed Garfield's question, claiming later that he denied Garfield because he did not want to see a presidency be undone by a simple point of order, meaning he did not want Garfield to stop the momentum for his own candidacy. At this point the vote totals for the major candidates stood at 312 for Grant, 275 for Blaine, 107 for Sherman, and 17 for Garfield. Then, during the thirty-fifth ballot roll call, Indiana shifted all 27 of its votes (mostly the Blaine column) to Garfield. Four Maryland delegates and one delegate each from Mississippi and North Carolina also switched their votes to Garfield, bringing his total to 50. Blaine, seeing that his chances for winning the nomination were slipping, came to the conclusion that James Garfield was the most suitable alternative nominee to himself. Garfield was a close friend, and Blaine felt that by supporting Garfield, he could defeat Grant and Conkling and possibly receive an appointment in Garfield's administration. Similarly, Sherman, acting upon advice from his colleagues, decided to shift all his support to Garfield, to "save the Republican Party." Both candidates told their supporters to support Garfield's nomination. A satirical Puck cartoon depicting Ulysses S. Grant surrendering to James A. Garfield after losing the 1880 Republican presidential nomination to him. With the Blaine and Sherman forces now rallying to Garfield, the move toward the Ohio congressman became a stampede on the next ballot, the convention's thirty-sixth. Garfield won 399 votes, 93 more than Grant, putting him over the top and giving him the Republican nomination. Blaine finished with 42, Washburne had 5, John Sherman had 3, and the remaining were split amongst other minor candidates. Garfield was so overwhelmed with emotion after winning the nomination that an Inter Ocean reporter noted that he looked "pale as death, and seemed to be half-unconsciously to receive the congratulations of his friends." The convention was in a mad frenzy as thousands of people chanted for Garfield, and later joined in the singing of the Battle Cry of Freedom. The Grant followers, like Roscoe Conkling, looked on with "glum faces" and made "no effort to conceal their disappointment." Conkling took great pride in the 306 delegates who had supported Grant throughout the entire balloting. With the Grant supporters, Conkling formed a "Three Hundred and Six Guard" society. The society held annual dinners, and even drew up a commemorative coin with the inscription, "The Old Guard". Garfield and the Ohio delegation desired a New York Stalwart as Garfield's vice presidential running mate, partly to placate Conkling, and partly to balance the ticket geographically. Levi P. Morton declined after consulting with Conkling, who was still unhappy over Grant's loss and advised Morton not to accept. The nomination was then offered (surreptitiously, and without consulting Garfield) to Chester A. Arthur, who had close Stalwart ties to Conkling, but who had impressed delegates with his work to broker the compromise on the selection of a convention chairman. Conkling tried to talk Arthur out of accepting, urging him to "drop it as you would a red hot shoe from the forge," but Arthur insisted that he would, calling the Vice Presidency "a greater honor than I ever dreamed of attaining." Arthur won the nomination after he received 468 votes, next to the 193 for Elihu Washburne, and 44 for the third major candidate, Marshall Jewell. Former Governor Edmund J. Davis of Texas and several others were also nominated, but received little support. After convention chairman Hoar banged his gavel at 7:25 P.M. on June 8, the longest ever Republican National Convention was adjourned. Garfield led the first front porch campaign for the Presidency. He did not travel that much, and he usually stayed at home to present his presidential agenda to visitors. Garfield enlisted the support of the other candidates from the convention to help with the campaign. The 1880 Democratic National Convention chose Winfield Scott Hancock as the presidential candidate and William Hayden English as his vice-presidential running mate. The election featured a very close popular vote that put Garfield ahead with a majority of less than 10,000; some sources put the margin as low as 2,000. [b] However, Garfield won the election with 214 of the 369 electoral votes in the country. On July 2, 1881, Garfield was shot by a former Chicago lawyer named Charles J. Guiteau at the Baltimore and Potomac Railroad Station in Washington, D.C. Guiteau was a staunch supporter of the Stalwarts, and he even gave speeches in New York to rally Grant supporters. After Garfield was elected president, Guiteau repeatedly tried to contact the president and his Secretary of State James G. Blaine in hopes of receiving the consulship in Paris. After finally being told by Blaine that he would not get the position, Guiteau decided to seek revenge on Garfield. He planned Garfield's assassination for weeks. After shooting Garfield, he proclaimed "I am a Stalwart and Arthur will be President." Garfield died on September 19, more than two and a half months after the shooting. After a lengthy trial, Guiteau was sentenced to death, and he was hanged on June 30, 1882. ^ The "famous apple tree" refers to the place where Confederate General Robert E. Lee waited on April 9, 1865, to receive Grant's offer to meet and finalize the surrender terms in the living room of Wilmer McLean's farm house in the village of Appomattox Court House. ^ a b There is considerable disagreement among historians about the exact vote totals. As Kenneth Ackerman explained in his 2003 book: "Because (a) voting was decentralized, (b) states certified electoral votes, not popular votes as 'official', and (c) Democratic votes were divided among various splinter groups, there remains today a range of published 'final results' for the 1880 presidential popular vote." The federal government lists the figure of 1,898, which is used in this article. Others give the margin as 7,018; 7,368; or 9,457 among others. ^ Ackerman 2003, p. 46. ^ Ackerman 2003, p. 18. ^ a b Ackerman 2003, p. 19. ^ a b Ackerman 2003, p. 44. ^ Ackerman 2003, p. 42. ^ Ackerman 2003, p. 40. ^ Ackerman 2003, p. 43. ^ Ackerman 2003, pp. 46–47. ^ Hesseltine 1957, p. 432. ^ Ackerman 2003, pp. 33–34. ^ Evans 1960, p. 28. ^ Ackerman 2003, p. 48. ^ a b McFeely 1981, pp. 482–483. ^ Ackerman 2003, p. 49. ^ a b Ackerman 2003, p. 50. ^ Ackerman 2003, p. 51. ^ Peskin 1978, p. 453. ^ a b c Ackerman 2003, p. 17. ^ a b Ackerman 2003, p. 74. ^ Ackerman 2003, pp. 7–16. ^ a b Ackerman 2003, p. 75. ^ a b Clancy 1958, pp. 28–31. ^ a b c d e Ackerman 2003, p. 30. ^ Ackerman 2003, p. 99. ^ Rutkow 2006, p. 11. ^ Rutkow 2006, p. 15. ^ Rutkow 2006, p. 16. ^ Rutkow 2006, p. 19. ^ Rutkow 2006, p. 23. ^ Ackerman 2003, pp. 66–67. ^ Rutkow 2006, p. 40. ^ a b c Ackerman 2003, p. 33. ^ Ackerman 2003, p. 23. ^ a b Ackerman 2003, p. 27. ^ Ackerman 2003, p. 28. ^ Ackerman 2003, p. 32. ^ Ackerman 2003, p. 34. ^ Ackerman 2003, p. 35. ^ a b Ackerman 2003, p. 54. ^ a b Ackerman 2003, p. 58. ^ Ackerman 2003, p. 59. ^ a b Ackerman 2003, p. 60. ^ Ackerman 2003, p. 61. ^ Ackerman 2003, p. 63. ^ a b c d Ackerman 2003, p. 64. ^ Ackerman 2003, p. 65. ^ a b Clancy 1958, pp. 88–89. ^ a b Ackerman 2003, pp. 80–81. ^ a b Ackerman 2003, p. 82. ^ a b Ackerman 2003, p. 83. ^ a b Ackerman 2003, p. 84. ^ a b Ackerman 2003, p. 85. ^ Muzzey 1934, p. 169. ^ a b Ackerman 2003, p. 86. ^ Ackerman 2003, p. 87. ^ Ackerman 2003, p. 88. ^ Peskin 1978, p. 460. ^ Ackerman 2003, p. 90. ^ a b Clancy 1958, pp. 104–105. ^ a b c Ackerman 2003, p. 91. ^ a b Ackerman 2003, p. 92. ^ Ackerman 2003, p. 93. ^ Ackerman 2003, p. 94. ^ a b Ackerman 2003, p. 95. ^ a b c Ackerman 2003, pp. 98–100. ^ a b Ackerman 2003, pp. 102–103. ^ a b Ackerman 2003, p. 101. ^ Ackerman 2003, p. 100. ^ Ackerman 2003, p. 103. ^ a b Ackerman 2003, pp. 103–104. ^ a b Ackerman 2003, p. 106. ^ a b Ackerman 2003, p. 107. ^ Ackerman 2003, p. 108. ^ a b Ackerman 2003, p. 109. ^ a b c d Doenecke, Justus. "James A. Garfield: Campaigns and Elections". Miller Center of Public Affairs, University of Virginia. Retrieved March 28, 2018. ^ Ackerman 2003, pp. 110–111. ^ Ackerman 2003, p. 120. ^ Ackerman 2003, p. 114. ^ Ackerman 2003, p. 115. ^ a b Ackerman 2003, p. 116. ^ a b Reeves 1975, pp. 119–121. ^ Peskin 1978, pp. 480–481. ^ Clancy 1958, pp. 117–119. ^ Ackerman 2003, p. 220. ^ Ackerman 2003, p. 220n. ^ a b c d NARA 2012. ^ Clancy 1958, p. 242. ^ Jordan 1996, p. 306. ^ Peskin 1978, p. 510. ^ Petersen 1963, p. 49. ^ a b Ackerman 2003, p. 221. ^ a b Clancy 1958, p. 243. ^ Ackerman 2003, p. 267. ^ Ackerman 2003, p. 384. ^ Ackerman 2003, p. 426. ^ Ackerman 2003, p. 444. Ackerman, Kenneth D. (2003). Dark Horse: The Surprise Election and Political Murder of President James A. Garfield. New York, New York: Carroll & Graf. ISBN 0-7867-1151-5. Hesseltine, William B. (1957) . Ulysses S. Grant: Politician. New York, New York: F. Ungar Pub. Co. ISBN 1-931313-85-7. Jordan, David M. (1996) . Winfield Scott Hancock: A Soldier's Life. Bloomington, Indiana: Indiana University Press. ISBN 0-253-21058-5. McFeely, William S. (1981). Grant: A Biography. New York, New York: Norton. ISBN 0-393-01372-3. Muzzey, David Saville (1934). James G. Blaine: A Political Idol of Other Days. New York, New York: Dodd, Mead, and Company. Peskin, Allan (1978). Garfield: A Biography. Kent, Ohio: Kent State University Press. ISBN 0-87338-210-2. Petersen, Svend (1963). A Statistical History of the American Presidential Elections. New York, New York: Frederick Ungar. OCLC 500975. Reeves, Thomas C. (1975). Gentleman Boss: The Life of Chester A. Arthur. New York, New York: Alfred A. Knopf. ISBN 978-0-394-46095-6. Rutkow, Ira (2006). James A. Garfield. New York, New York: Macmillan Publishers. ISBN 978-0-8050-6950-1. Evans, Frank B. (January 1960). "Wharton Barker and the Republican National Convention of 1880". Pennsylvania History: A Journal of Mid-Atlantic Studies. 27 (1): 28. "Historical Election Results: Electoral College Box Scores 1789–1996". National Archives and Records Administration. 2012. Retrieved 25 May 2015. This page was last edited on 4 January 2019, at 18:35 (UTC).